This week marks one year since Hurricane Maria made landfall on the shores of Puerto Rico. Along with Hurricanes Harvey and Irma, the 2017 hurricane season brought devastation to communities across the United States. 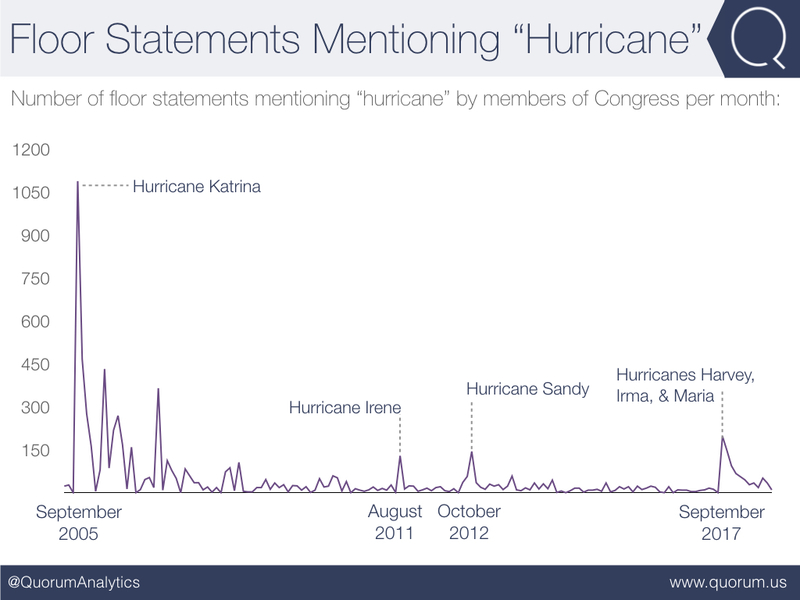 Using Quorum Federal, we compared the volume of congressional floor statements mentioning hurricanes from 2005 to present day. One month after their respective landfalls, Congress mentioned Katrina four times more than Maria. In the month following Hurricane Katrina in 2005, members of Congress mentioned the hurricane in 1,126 congressional floor statements. One month following Maria, only 256 floor statements from members mentioned the hurricane. With Quorum Federal’s comprehensive social media monitoring of elected officials, we identified which members of the 115th Congress have been most vocal on Hurricane Maria over the past year. 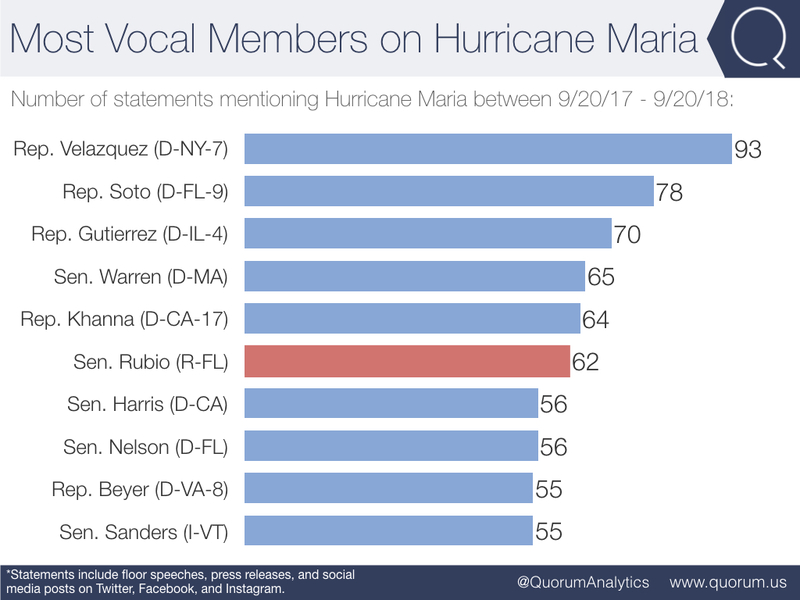 Senator Rubio (R-FL) is the only Republican in the top ten most vocal members on Hurricane Maria. Nine of the ten most vocal members on Hurricane Maria are Democrats. With 62 mentions, Sen. Rubio leads his party as the most vocal Republican on the hurricane. Rumored 2020 presidential hopefuls like Sen. Warren (D-MA), Sen. Harris (D-CA), and Sen. Sanders (I-VT) are all represented in the top ten. On average, Democrats mention Hurricane Maria five times more per month than Republicans. 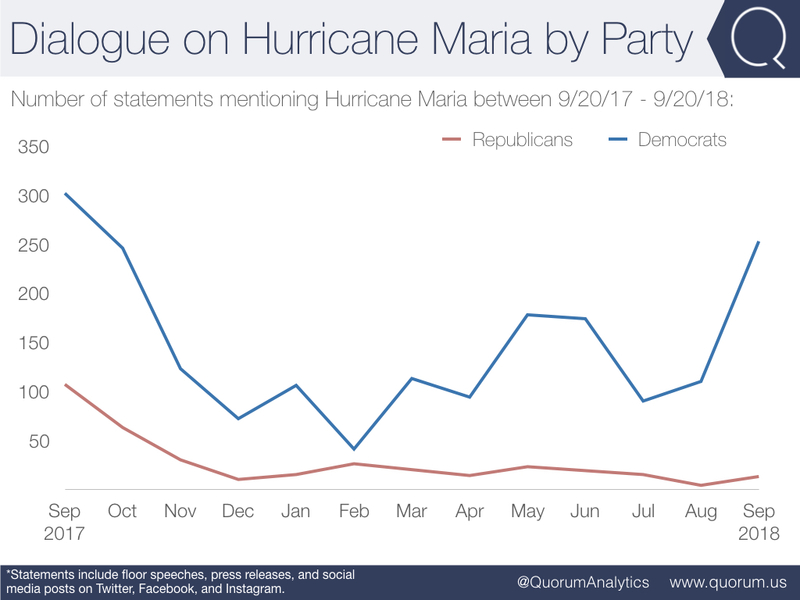 Between September 2017 - September 2018, Democrats are averaging 146 mentions of Hurricane Maria per month compared to Republicans' 27 mentions per month.